Starbucks has grown to be a world-wide brand with over 15,000 locations. Its extra-ordinary success is often attributed to providing a high-quality customer experience. An important aspect of the Starbucks experience is customizing drink orders. 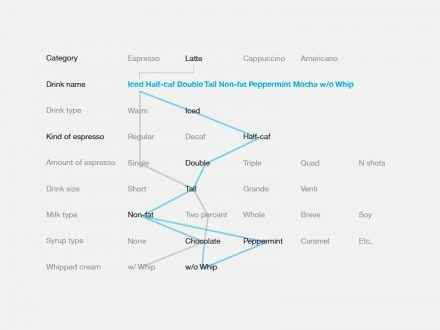 In order to support a high degree of customization, Starbucks has created a deep and flexible framework, and a language for describing the framework and progressively introducing it to customers. This article examines the Starbucks drink framework and the language that describes it. Starbucks has carefully planned its customer journey. which means ordering for the first-time can be very simple. But customers familiar with the drink framework, can specify drinks not explicitly on the menu, creating literally millions of options. to “design” their own drink. and having customers teach each other. The Starbucks drink framework invites participation and exploration. Learning the language creates a sense of empowerment and belonging. It helps customers feel they are part of Starbucks. Here’s how the Starbucks drink framework is organized. Starbucks drink offerings can be divided into four categories: Espresso drinks, Drip coffee, Frappuccinos, and Tea drinks. Espresso drinks use shots of espresso as a base to build upon. Drip coffee is common coffee, hot water percolated through ground coffee beans. Frappuccino is a proprietary word for Starbucks’ blended, dessert-like coffee drinks, and tea drinks range from traditional tea bags in hot water to iced tea mixed with lemonade and other fruit juices. Espresso drinks can be divided further into four sub-categories: Espresso, Latte, Cappuccino, and Americano. Espresso shots served alone comprise the first subcategory. The Latte is a drink composed of a number of espresso shots mixed with steamed milk, topped with frothed milk foam. The Cappuccino is like a Latte, but with less milk and more foam. The Americano is composed of espresso shots and hot water rather than milk. The Latte is the basis of most drinks on Starbucks’ menu. The main difference between most Latte drinks is simply the choice of flavored syrup. Others differ by being served over ice rather than warm. One exception is the Caramel Macchiato, which varies from the standard latte by three parameters. The Caramel Macchiato is made with vanilla flavored syrup and is topped with caramel butter—an ingredient unique to the drink. The third parameter is an advanced one—build order. The Caramel Macchiato is built upside down. “Macchiato” is Italian for “marked.” In traditional coffee jargon, it refers to an espresso shot marked with foam on top. In Starbucks’ Barista-speak, it means foam marked by pouring espresso through it. The Caramel Macchiato is built upside down—the espresso is poured in last, through the foam. Despite the depth and complexity of the drink framework, ordering a drink requires the customer make only two choices—the name and size of a drink. Drinks come in four sizes; 8oz Short (available, but not on the menu), 12oz Tall, 16oz Grande (Italian for large), and 20oz Venti (Italian for 20, a Starbucks trademark). The name of a drink (e.g. Latte or Mocha) represents a set of instructions for its creation (a mocha, for example, is a latte with chocolate syrup). A customer need not even remember the two options required for ordering. If unsure of the name of a drink, a customer can get help from the barista taking the order. The barista will also prompt for size, if not specified. Options unspecified in the order are implied. For example, a Mocha comes with caffeinated espresso and whipped cream by default. The minimum drink order, e.g., “Tall Mocha,” specifies 2 criteria (the drinks size and name) but implies at least 6 more. The drink comes warm (rather than iced) and regular (rather than decaffeinated) unless otherwise specified. The amount of espresso in the drink corresponds to its size—a Tall comes with one shot. The drink will be made with 2% milk—the standard at Starbucks as of last year. The drink’s name “Mocha” implies the last two criteria: the inclusion of chocolate syrup and whipped cream topping. Other cup types: In addition to regular and iced cups, customers may request a ceramic “for here” cup, or take a drink “to-go” in their own travel mug. Tempurature: The drink’s temperature may be requested “cooler” or “extra-hot” or even to a specific degree (e.g., 167°F). Build order: The order in which the drink is built may be customized—have it upside down like a Caramel Macchiato. Ristretto shots: Baristas make espresso shots by “pulling” hot water through coffee grounds. Older, less automated espresso machines allow the barista to make “short pull” or “ristretto” shots. These abbreviated shots are slightly sweeter, and less bitter. Espresso alternatives: Not all drinks in the Latte framework contain espresso. Chai Tea and Green Tea Lattes substitute concentrated tea for espresso. Amount of foam: A “dry” drink has more foam and less milk, a “wet” drink contains less foam. Amount of syrup: The amount of syrup measured in half-ounce pumps may also be specified. Additional syrups: The Mocha comes with chocolate syrup, but customers may choose from around 15 flavored syrups and may also combine syrups, e.g. Peppermint Mocha. Many types of syrup are available consistently; others (such as pumpkin or gingerbread) are available only in a particular season; still others are available as temporarily promotions. With so many options, how many variations are possible? 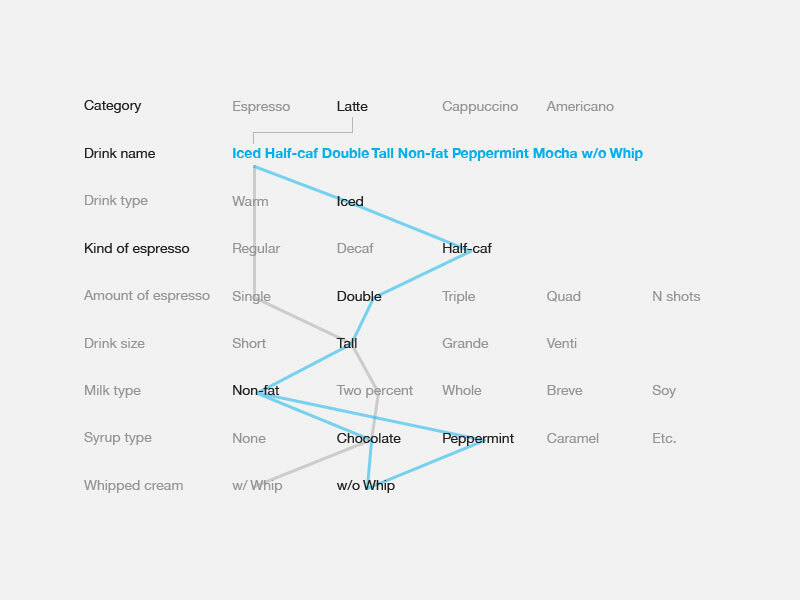 With only one syrup the Starbucks latte framework offers almost 200 million variations. Add a second syrup and there are over 1.3 billion—enough for each Chinese citizen to have his or her own personal drink. The new customer has heard the language—Barista-speak. She may realize from hearing the other customer that the size of the drink comes first in the order and that she can ask for “non-fat” as an option. When it is her turn to order, she can call on prior knowledge of coffee drinks, ask the barista to help her decide, or look to the menu for some ideas. When she orders, the barista will clarify the order and repeat it back. When the order is ready another barista will call out the order again. Each order is repeated three times. Repetition supports the learning process. Over time, the customer learns new options from the baristas, from other customers, and from her friends. She may learn Barista-speak and the underlying framework for designing drinks, but not all at once. Customers learn at the pace they set. The drink framework and language offer an easy way for those unaccustomed or unaware of the system to order without difficulty. The system’s full complexity waits for customers to discover it. The process of learning Barista-speak is a carefully designed journey. New customers may have no concept of the drink framework or ordering language but that does not prevent them from ordering. They can order from the menu or get guidance form the barista. Customers may begin to customize drink orders after learning new options through promotions, by hearing other customers, and by sharing drink preferences with friends. Upon recognizing the language, customers may begin to seek out new options and experiment with new variations. Experienced customers may suggest new variations to friends and teach the language to beginners. Learning the language gives the customer more control—the power to order a drink precisely to preference. It also creates a sense of belonging—of having insider knowledge and status. Empowerment and belonging make customers feel that they are a part of Starbucks. They encourage repeated visits and build loyalty. These lessons can be applied to many other interaction design and service design problems. This was very helpful. I’ve always just ordered the first size coffee that I see on the menu, mostly because I didn’t know all that Starbucks had to offer and felt that I would take too long to stand there and “figure stuff out” while more experienced coffee orderers were waiting. anyway, this is really great info. And still, I order a large black coffee and the morons return it to me with an inch and a half for me to put in… what exactly? I ordered it black! @OtherSean: Frustrating! Try ordering “coffee, no room [for cream]” next time. At 6:00am while driving a semi on I-90 I wanted (needed!) some coffee. The experience I had at a Starbucks in a NY roadside while attempting to get a drip coffee with room for cream in the largest size possible has caused me to avoid all Starbucks permanently. I would argue, though, that if you’ve ever been to a relatively new Starbucks location (particularly in a small town) you’ll find plenty of beginners who clearly do not find it simple. And regional differences aside, if a person just wants a cup of coffee, Starbucks is probably not the ideal destination. I think the menu system (and the Starbucks product in general) is targeted more toward people who have their own signature drink. Are you sure Starbucks created this? I worked in coffee shops for ages and we had a different system in each one. Most coffee shops employ something like this to my knowledge, but I have no idea when it started. It could be that Starbucks grabbed this from somebody else. Thanks for all the info. ^^ Now that I have a registered Sbux card, I find myself here a lot more often to get work & homework done. It’s relaxing, the temperature is nice (I bring a jacket if I get too cold), and all that combined with free refills & free wifi… it’s like a second home! But I’ve been wanting to know more about how the drinks are ordered, made, and what kind of other drink options I have. So this helps a lot. This is extremely useful! Thanks for sharing this. I am doing a small assignment on a starbucks campaign at school. I was wondering if i can use info from your deck. Of course I will be crediting the info to you as well as your site. It is no longer a macchiato if you order it ‘upside down’ you are already saying the drink wrong. Everyone ordering upside down just has no idea what is in their drink or what macchiato even means… btw macchiato means mark. As in marking the milk. When you make it upside down it is a latte not a macchiato. It would be like ordering a vanilla latte upside down with caramel on top when you actually want a caramel macchiato.